The PGA Tour travels to Colorado this week for the penultimate event in the FedEx Cup playoffs. Zach Johnson defends the BMW Championship at Cherry Hills Country Club. The top-70 on the FedEx Cup standings will contest this tournament with the top-30 going on to the season-ending Tour Championship at East Lake. After his victory in the Deutsche Bank Championship, Chris Kirk leads the standings. He’s 819 points clear of Rory McIlroy with Hunter Mahan just another 24 points back. But, with 2,500 points available for the winner this week, the battle for the 2014 FedEx Cup is still wide open. A key aim for the players at Cherry Hills will be to secure a place in the top-five on the standings. The points are re-set before the Tour Championship and anyone in the top-five will be able to take the FedEx Cup crown and the $10 million bonus. In last year’s event Jim Furyk took the lead with an incredible 59 in the second round at Conway Farms. But he couldn’t maintain that pace and he was overtaken by Zach Johnson, who closed with a 65 to take the title. Nick Watney finished in second spot after a final round 64. Cherry Hills is a William Flynn design just to the south of Denver that opened for play in 1922. It was the site of the 1960 U.S. Open won by Arnold Palmer, and the course also played host to the 1941 and 1985 USPGA Championships. The star players like McIlroy, Scott, Day and Rose will be strong favourites. But who else might make a run at the title? Billy Horschel – A streaky player, he had a chance to win last week before making a mess of the final hole. He’ll look to redeem himself this week. Kevin Streelman – Another man capable of impressive runs – see his seven birdie finish to win the Travelers earlier this year. He was in contention with 18 holes to play last week but stumbled to a final 73. If he can string four good ones together, he could contend. 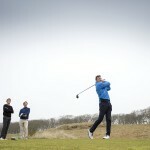 Russell Henley – He played superbly well in the Deutsche Bank to finish in a tie for second. He’ll be aiming to keep the good play going this time out. Key hole: 17th. A par-5 of 544 yards, it looks innocuous on the card – short enough to be something of a pushover perhaps for today’s power players. But, with two sets of cross-bunkers to negotiate on the fairway and an island green, it’s a demanding hole. In 1960, Ben Hogan found the water here to open the door for Arnold Palmer.